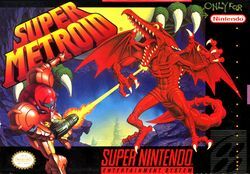 Super Metroid (スーパーメトロイド, Super Metroid) is the third installment in the Metroid series developed by Nintendo, but is chronologically the seventh game in the series. The game appears on the Super Nintendo Entertainment System and Virtual Console. It appears as a masterpiece in Super Smash Bros. Brawl and Super Smash Bros. for Wii U. In Brawl, it can be played for 180 seconds and has a save that starts in the battle against Ridley. In Smash Wii U, it can be played for 240 seconds and has two save files: one at the beginning of the game and one in Norfair. Screenshot of the Masterpiece in Brawl. Samus's neutral special move, Charge Shot, and her grab, Grapple Beam, both come from this game. In addition, the homing missiles in her side special move come from this game. Planet Zebes features Ridley and Waver sprites from this game. The design of Kraid from Brinstar Depths originates from this game. "Theme of Samus Aran, Space Warrior" and "Vs. Ridley" come from this game. "Theme of Samus Aran, Space Warrior" is an orchestral remix of the music that plays during the opening and credits of this game. "Vs. Ridley" is the song that plays when facing Ridley. This page was last edited on October 4, 2018, at 11:03.